As heard on Osky News Live powered by Thunder Country KIIC, Oskaloosa earned a split in their home wrestling triangular Tuesday night falling 49-27 to Albia but bounced back to defeat Fairfield 54-18. Albia also defeated Fairfield 62-3. A lot of fans came to see Albia’s Aden Reeves, a two-time defending state champion, ranked number one in the nation, and he didn’t disappoint, going 2-0 at 126 pounds with a 1:52 fall against Oskaloosa, then put on a takedown clinic winning by technical fall 26-11 over Fairfield. In the Albia dual, it was tight early as the two teams swapped the first four matches, plus Osky got a forfeit win to lead 15-10, but then Albia ripped off six straight wins, 145-195, five by fall, to take control. 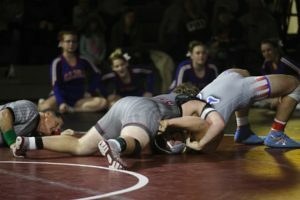 Oskaloosa got a 5-3 decision win from Salvador Gonzales at 120, falls from Zach Beebe at 132, Tyson Breuklander at 220, and Keegan Mitts-Butler at Heavyweight plus a forfeit win for Leland Evans at 138. To close the night vs Fairfield, Oskaloosa got wins via fall from Beebe at 132 (3:10), Wyatt Krier at 145 (3:30), Cody Gunn at 160 (:36), Emmit Boender at 195 (4:23), and Tyson Breuklander at 220 (:57), plus decision wins from Phillip Abrahamson at 113 (6-2), and Will Campbell at 182 (2-0), and received forfeits for Rylie Sirovy at 106, Evans at 138 and Mitts-Butler at Heavyweight. Oskaloosa travels to Dallas Center-Grimes for a triangular vs. D-C-G and Des Moines Lincoln Thursday night then heads to the Ankeny tournament on Saturday. Posted by Jamie Brockman on Jan 10 2019. Filed under School Activities. You can follow any responses to this entry through the RSS 2.0. Both comments and pings are currently closed.